Both children are home, the pantry is bursting with provisions, yet…I used the last of my Paprika for a rub I was preparing on Sunday. 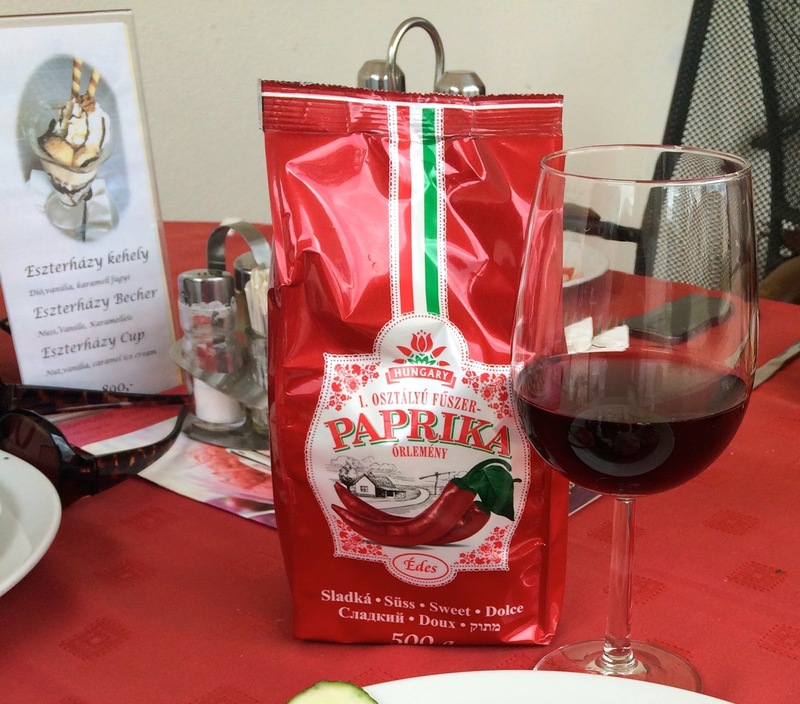 Two options on an otherwise schedule-free day presented themselves: 1) add it to the next grocery list; 2) take a spontaneous half-day trip across the border to the Birthplace of Paprika, Hungary. What would you do? 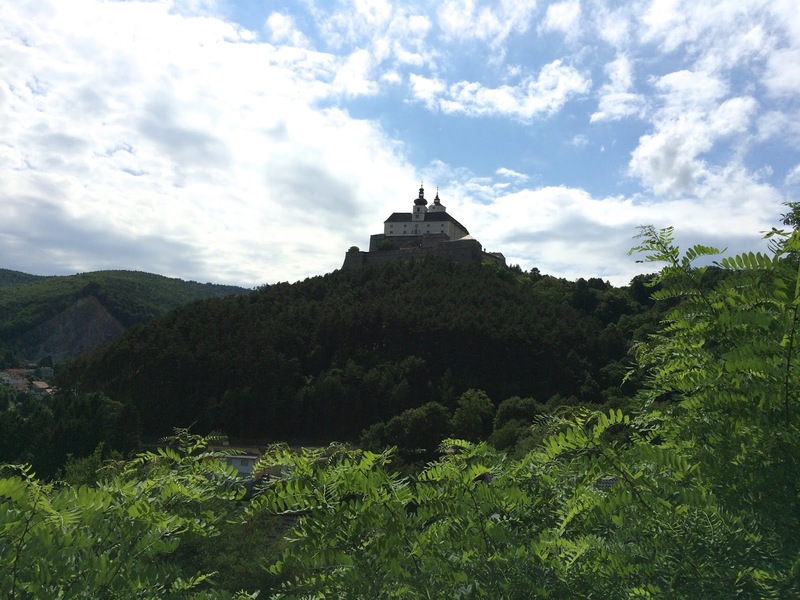 Along the Austrian-Hungarian border there a few palaces and castles that we haven’t yet seen, and in the time it took to reach the A4 I had mapped a route. Our first stop was Schloss Halbturn, built as a hunting lodge for Emperor Karl VI. Now it sponsors special art exhibits and hosts weddings and other celebrations. Tucked down a lane shaded by Linden trees, it made for a lovely first stop. Bouquets from the previous days’ wedding, charmingly at rest. The Austrian flag is striking, I think. The design for the flag dates to the early 1200’s and Leopold V, Duke of Austria’s return from the battlefield. Though his battledress was soaked with blood, the area under his belt was white. There you have it. Inside the palace was an exhibit of 1900-1930 design in Austria, everything from decorative pieces to clothing. Most enjoyable. Along this route we whipped past a sign reading, “Isrealitische Freidhof” and made a detour. The customary signage is for a “Jüdische Freidhof.” The gate was locked, though it was possible to peer over the walls. Nearly 400 Jews were deported from this town as early as 1938. Old Jewish cemeteries around here make me sad, as it’s not likely that many descendants are visiting. Storks! I never tire of seeing these magnificent birds. Nearing the border with Hungary we found abandoned border patrol barracks, stripped to the foundation. The House of Esterhazy was the premier landowner of the Kingdom of Hungary and they were in good, very good, standing with the Habsburgs. France has the original Versailles. Bavaria has its version, Könighschloss Herrenchiemsee, and Hungary has Esterhazy Kastely, its “Versailles” and one of holdings of the Esterhazy Family. The palace is the loveliest shade of pink, and the gates are my favorite of all palace gates I’ve seen. 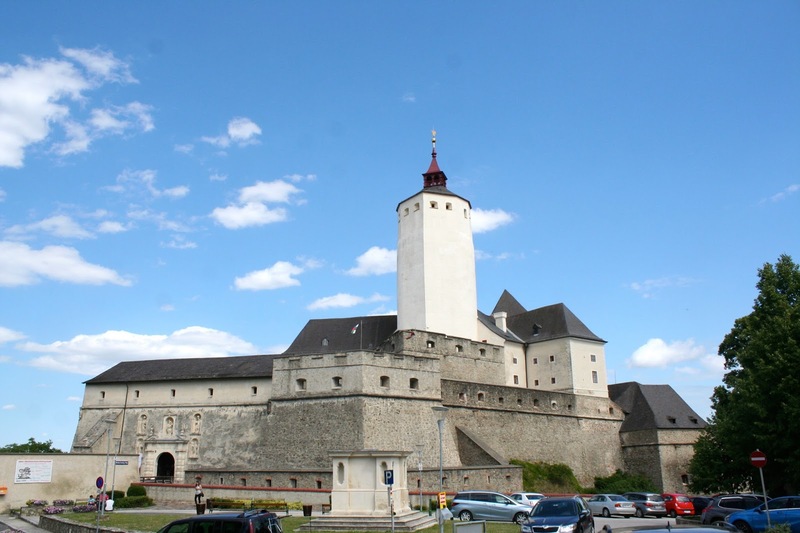 During WWII the Esterhazy Family scattered; after 1945 the Hungarian government confiscated the property for its use. A foundation established by the wife of the last ruling Esterhazy Prince now helps preserve the cultural heritage of the family. Making our way home we spied Burg Forchenstein in the distance. This, too, is an (Austrian) Esterhazy holding since 1622, except for a couple of hundred years when the Habsburgs held it. 17th century home exchange, if you will. The castle sits on a hilltop, and even has a moat! As the afternoon was waning we did not tour the interior, but have noted its Adventmarkt for a return visit. Oh, and I did purchase the Paprika at a farm stand near Esterhazy Kastely, right before dropping in a local Etterem for the lunch special of deer stew. My kind of grocery run.